Each frame is .1 seconds apart. The level of performance of Gary Hall Jr at these championships was inferior to those displayed in the other featured analysis in this section of the Swimming Science Journal. Frame #1: The right arm enters short of full stretch and is set up to slide further forward. The drag forces created by this action can be seen by the trail of turbulent water flowing from the side and back of the hand. The left arm is about midway through its pull. The hand/forearm-propelling surface is angled markedly rather than being vertical. Letting the arm set-up "go" causes this and results in the elbow moving faster through the water than the hand. This is akin to a mid-stroke "dropped-elbow" and is a fault because it prevents significant force being created by adduction of the upper arm. 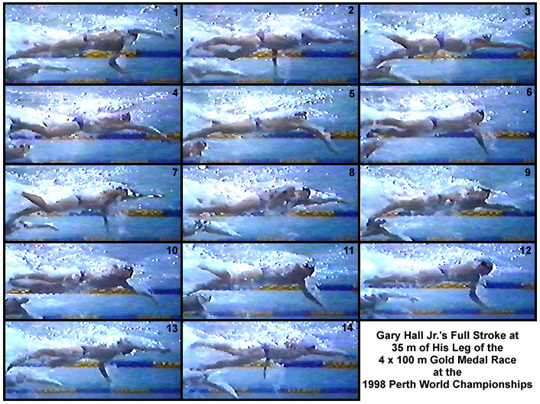 This feature was also evident in Hall's previous analysis when he was swimming faster but it was not exhibited to the same extent as here. The left leg kick that normally counter-balances the right arm entry has yet to occur. It offsets vertical forces and so the "sliding" horizontal entry only inhibits the swimmer's progression. The kick will be delayed until the swimmer begins to press down. The shoulders roll with the entering right arm. Frame #2: The right arm extends further forward with its resistive drag clearly visible. The left leg is positioned ready to kick. The shoulders roll to almost flat. Left arm adduction has ceased and propulsion once again is developed by the vertical hand/forearm surface. The swimmer's overall position is one of good streamline. Frame #3: The right arm begins to press down and be repositioned for effective force development. The counter-balancing left leg kicks. The left arm exits elbow first. The right leg is positioned to kick to counter-balance the exiting left arm. It should be noted that all sprinters of the modern era perform four-beat kicks, each kick counter-balancing vertical forces created by entering or exiting arms. This feature contradicts the common misconception that sprinters perform six-beat kicks. The head begins to turn to the left and begins to rise. Frame #4: The right upper arm is medially rotated to a slight degree causing the elbow to momentarily stay closer to the surface than the hand. The elbow bends. These two movements reposition the eventual propelling surface of the arm. The development of force can be seen by turbulence emerging from the back of the right forearm. The right leg kick counter-balances the vigorous vertical movement of the recovering left arm. The head is turned and rises further causing the back to curve. Frame #5: Right arm propulsion is now obvious. The whole arm generates drag turbulence. Some "experts" opine that the upper arm does not contribute to propulsion. However, there is turbulence coming off the upper arm as well as the more traditional propelling surface of the hand/forearm. The head is lifted and inhalation occurs, movements that increase frontal resistance due to exposing the torso to the oncoming fluid. A shallow right leg kick is completed to match the short length of time during which vertical forces are created by the recovering left arm. Frame #6: The right arm sweeps backward powered by vigorous adduction of the upper arm. If the forearm and head are compared to the color-change region of the lane buoys, it can be seen that the arm has not moved through the water to any great degree but that the swimmer's head and shoulders have moved appreciably forward. This is a clear depiction of the concept of an "anchored" arm and the swimmer propelling past that fixed arm. The head begins to return. The left arm sweeps forward over the water. Frame #7: Right arm propulsion continues with upper arm adduction nearing the end of its range of effectiveness. There is no "dropped-elbow" like that of the left arm. The left arm enters fully stretched. The final turn of the head after breathing appears to be linked to the movement of the recovering left arm. The head turns and looks primarily forward. The right leg is positioned to kick to counter-balance the left arm entry. Frame #8: In a movement that is very different to that of the right arm entry, the left arm begins to "grab" the water immediately upon entering. The right leg kicks. The shoulders roll to position the arm to create a large amount of force close to the swimmer's centerline. The head continues to look forward. The right arm continues to push back and up as it initiates recovery. Frame #9: The swimmer "leans" on the left arm as opposed to medially rotating the upper arm and creating an elbows-up position. Only the hand and forearm generate propulsive drag in this movement. The right hand fingers are all that remain in the water as the arm is extracted. Frame #10: The left arm continues to press downward by the swimmer leaning heavily on it. The direction of the drag force turbulence is not horizontal but vertical. The left leg kicks to counter-balance the recovering right arm. The head still looks forward and contributes to an exaggerated curvature of the chest (back), which increases frontal resistance. Frame #11: The left arm continues to be moved as a total unit. Bending the elbow repositions the forearm more under the body. The left leg kick is completed as the right arm approaches entry. The head begins to look more toward the pool bottom. Frame #12: As the recovering right arm "dives" on entry the head is lowered further. The left leg rises preparatory to kicking. The left elbow moves rapidly rearward while the hand, in comparison, is slowed noticeably. If a force curve could be obtained from this stroke it would be two-phased with only a minor proportion of the total force being a horizontal component. The head looks to the bottom and is angled more than 45 degrees. Frames #13-#14: The stroke cycle is repeated. Gary Hall Jr's stroke is asymmetrical, the left arm exhibiting a totally different movement pattern to that of the right arm. The left arm pull also appears to contain more critical movement "errors" than the right. Improvement might be possible if the forms of each arm pull were more similar and force production better balanced. One can only speculate why the swimmer is not swimming as well as in the past. Certainly, the left arm pulling motion and the carriage of the head, which disrupts streamline, could contribute to performance decrement.